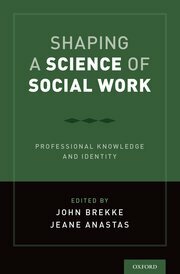 Recent SSWR award winner and Fellow John Brekke is the co-editor of Shaping a Science of Social Work, a new publication that defines social work science and the future of the profession. The book features ideas from a July 2016 meeting of social work scholars at the IslandWood retreat center and includes a number of research ideas from Academy Fellows. It also discusses the importance of the Grand Challenges Initiative.